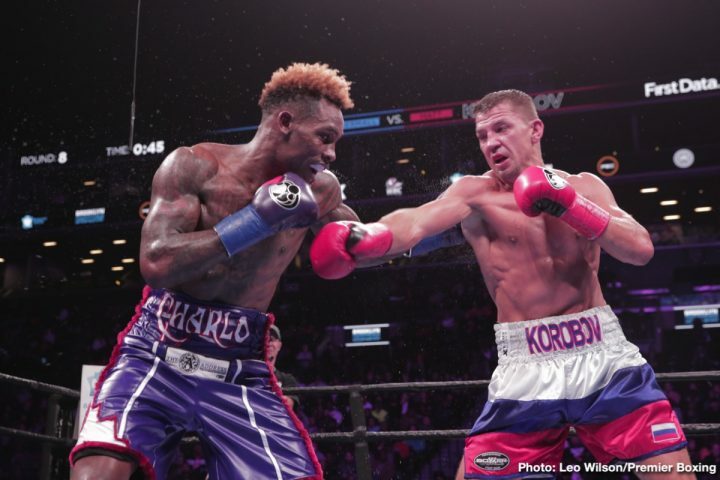 Matt Korobov: "People know I won"
By Jeff Aranow: Jermall Charlo (28-0, 21 KOs) was fortunate to escape with his unbeaten record intact and his interim WBC middleweight title still in his possession last night after tangling with 2008 Russian Olympian Matt Korobov (28-2, 14 KOs) and getting the worst of it for 12 rounds, only to escape with a highly questionable unanimous decision at the Barclays Center in Brooklyn, New York. The 35-year-old Korobov came off of a 1 1/2 year layoff and was still able to get the better of the highly hyped Charlo last Saturday night. The judges had Charlo winning by the following set of scores 116-112, 119-108 and 116-112. Overall, the boxing public on social media didn’t view Charlo as the winner, and many of them were highly critical of the the 11 rounds to 1 score turned in by judge Larry Hazzard Jr. Some boxing fans thought the 119-108 score was a mistake by the judge, as there was seemingly no way that the Charlo vs. Korobov fight could be scored eleven rounds to one in Jermall’s favor. It doesn’t make sense unless it was a mistake, since Charlo was lost in the first six rounds, and lucky if he was given two rounds. The judge that scored it 119-108 saw Korobov winning only ONE round in the entire 12 round fight. It makes no sense. Afterwards, Korobov had no question in his mind that he should have won the fight against Charlo. He says he knows that the boxing fans saw him winning the fight. In a perfect world, Charlo and his management would recognize that they were lucky to get the victory over Korobov, and they would do the right thing and give him an immediate rematch to quite the controversy. However, this is boxing, and the sport isn’t run that way by the promoters of the fighters. When the judges give the A-side fighter a controversial decision, their promoters speedily move them forward without hesitation, treating the victory as if they received a mandate of agreement from the fans. As such, Korobov is unlikely to get a rematch with Charlo ever. Korobov had his chance, and the judges scored the fight for Charlo. That’s the end of story. In the old days, the management for fighters would setup a rematch to settle the controversy, but that’s not how things are now when it comes to a fight where there’s a winner and a loser. It’s a different story obviously when a fight involve two popular fighters, and it’s scored a draw, like we saw with Deontay Wilder vs. Tyson Fury fight on December 1. Those two are going to fight again due to the big money that can be made off that fight. There’s not big money that can be made with a Charlo vs. Korobov rematch. Charlo wants to fight superstar Saul Canelo Alvarez, who holds the WBC middleweight title. Charlo is the mandatory for Canelo. But if Charlo faces Korobov again, there’s a chance that he could lose that fight if there’s arguably a big improvement on the judging from what we saw last Saturday night. The punch stats favored Charlo, but many of his shots landed were done in the 12th round after he had hurt Korobov. Before that, the stats clearly were favoring Korobov in the first 11 rounds. There were no knockdowns in the 12th, so the round had to be scored 10-9, one would think. Korobov connected on 128 of 457 punches for a connect percentage of 28, according to CompuBox’s statistics. Charlo landed 170 of 654 punches for a lower connect rate of 26. A lot of the punches Charlo landed were jabs rather than power shots that we were seeing from Korobov. Charlo landed 56 of 340 jabs. For his part, Korobov landed just 9 of 106 jabs. He had a harder time landing his jabs due to Charlo’s head movement to avoid them. What Charlo couldn’t avoid was the southpaw Korobov’s left hand. He was hitting him with it all night long, and not missing often. Going into the 12th round, things looked bad for Charlo. Korobov appeared to have an insurmountable lead in getting the better of Charlo in at least eight of the first eleven rounds, and it looked like he needed a knockout or a few knockdowns to win. Charlo’s trainer Robbie Shields encouraged him to come out and fight hard looking for a knockout. Charlo responded well in hurting Korobov with a right hand to the head. Charlo tried in vain to finish Korobov off in landing over 30 punches, but he tired out and wasn’t able to get the knockout. Charlo said after the fight that he was thinking about his twin brother former World Boxing Council junior middleweight champion Jermell Charlo during the fight, as he had lost earlier in the night to challenger Tony Harrison in an upset 12 round unanimous decision defeat. Jermall wanted to make sure that he didn’t suffer the same fate as Jermell, so he poured it on in the 12th, trying to score a knockout of Korobov. It didn’t work, but Jermall still got the unanimous decision win, albeit a controversial one. Charlo followed Shields’ instructions to the letter in taking the fight to Korobov, hurting him, and then going all out to KO him. Charlo didn’t realize that Korobov could take a punch, which prevented him from scoring the knockout that he might have needed had the scoring been different by the three judges. The last time Jermall had been in a 12 round fight was in May 2016 in his match against former WBA junior middleweight champion Austin Trout. Charlo looked ragged in that fight too, and struggled in the later rounds against a better conditioned Trout. Last night, it was Charlo that as the stronger, better conditioned fighter down the stretch. Korobov fights at light heavyweight, and he had drained down to 168 to get ready for an 8-round fight on the undercard against journeyman Juan de Angel (21-9-1, 19 KOs). Korobov was asked to move down to 160 to take the fight with Charlo six days before the fight after Willie Monroe Jr., Jermall’s originally scheduled opponent for Saturday, tested positive for a banned drug, and was pulled from the card. Korobov had to lose an extra eight lbs in just six days. With all the weight that Korobov had to take off, along with his inactivity over the last couple of years, it wasn’t surprising that he faded in the last four rounds against Charlo. Asking a light heavyweight to come down from the 175 lb division to fight at middleweight, it’s not easy for them to do. Korobov proved that he could do it and still perform well for eight of the twelve rounds, but not a lot of other light heavyweights would have been able to lose that kind of weight without being weight drained on the night. Korobov’s performance should help him get other important fights in the near future; if not at middleweight, then at super middleweight or light heavyweight. A rematch against Charlo would be great, but it’s not likely to be in the cards. Korobov needs to be kept active by hi management, as he showed that he’s got the talent to beat the best at 160 last night. A lot of boxing fans believe that Charlo will eventually rule the middleweight division due to his youth. He’s got the size and youth to wait out guys like Gennady Golovkin and Daniel Jacobs, and take over after they get old. Canelo Alvarez might end up moving out of the weight class one of these days, and that’ll leave Charlo as the top guy in the weight class. Korobov exposed Charlo last night with his boxing ability, and his accuracy with his left hand. Korobov put things in perspective in showing that Charlo is not as good as many boxing fans previously thought he was. Charlo is still a good fighter, but a very flawed guy that is extremely raw in the skills department. Shields has taught Charlo some things, but he looks like he’s not firing on all eight cylinders the way that a well-schooled middleweight would. It’s hard to foresee Charlo beating GGG, Canelo, Jacobs or Demetrius Andrade if any of those fights were made right now. What must be noted is the 6’0″ Charlo has been winning a lot of his fights on his size advantage over his smaller opposition. We saw that when Charlo was fighting at junior middleweight, and we’re now seeing pretty much a continuation of that with him fighting at middleweight. Last night, Charlo didn’t have a big size advantage over Korobov, who now fights at light heavyweight. Without the size advantage that Charlo is accustomed to and depends on, he was lost out there against a guy that was as big as him. Charlo wasn’t the same fighter facing an opponent that could reach his chin with power shots, and take his best punches all night. The fight would have been very different if Korobov had punching power like some of the harder punchers in the light heavyweight division like Artur Beterbiev. If Charlo had to take Beterbiev’s shots last night instead of Korobov, there would be no talk today about the odd scoring by the three judges. The fight likely wouldn’t have gone the distance due to Beterbiev’s punching power being too much for Charlo. However, it’s unlikely that Charlo’s management would have given the green light for him to use a puncher as a last minute replacement. Korobov was clearly chosen for a reason in that respect. Charlo vs. Korobov was televised on Premier Boxing Champions on FOX and FOX Deportes last Saturday night. The ratings have not come out for the fight event, but it’ll be interesting to see what they are once they’re released by the networks.